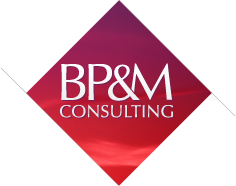 BP&M is a different kind of consulting firm. We’re unique in 3 key ways. At BP&M, your success is our only agenda. Our goal is to help you deliver sustainable value to your clients. What does “your success” really mean? It means that the basic non-negotiables are fulfilled—projects delivered on schedule, on budget, and on scope—but also that your clients gain the benefits of your improvement endeavours. In fact, value add for the client is how we define the improvements in the first place. Our projects are organized to promote employee engagement by placing your employees—not consultants—in the core roles. Employees lead; we assist. We only undertake projects once the conditions required for success are present. These conditions include executive buy-in, placing employees in lead roles, and a measurable result to target. While all of our consultants have deep background in technology, our core focus is business. We are experts in bringing together the whole equation: solving your real-world business challenges, empowering your people to work smarter despite shrinking budgets, getting all players on board with the solution, and ensuring that your technology decisions are aligned with the organization’s business objectives. We achieve these results through our government-focused Lean methodology and our patented Abeo™ approach, while supporting IM/IT with our combined business and technical expertise. With Lean for Government, BP&M helps Programs, Corporate Services, and IM/IT work together to improve key processes in order to deliver exceptional services for Canadians. Abeo™, BP&M’s patented business engagement framework, is a model for coordinating functional areas in your department or agency. Our services to IM/IT focus on helping CIOs become co-creators of enterprise-level positive change. While focusing on people and processes, we also offer the credibility fundamentals you would expect from a team of senior resources who individually possess an average of 15 to 30 years of experience. These professionals typically began their careers delivering IM/IT solutions, so they have a deep understanding of technical challenges and opportunities. At the same time, they also have experience in key business areas, including management, financial analysis, process improvement, customer relationship management, and marketing. And most BP&M consultants are change management certified. This experience, combined with our local presence, means we also have key contacts in the National Capital Region—connections to the federal community that give us valuable up-to-the-minute insight into local trends, best practices, upcoming legislation, policy, and key initiatives relevant to your undertaking.